"Move Well - Feel Well - Be Well." Posted on April 26, 2018 by Molly Scott, D.C. I would like to address a topic that people don’t often discuss with others, but is a problem for so many…especially children! This information IMMEDIATELY makes me think; Of course the peak is in preschoolers! What happens to kids age 3-5 going to preschool?! Jeanie Ward’s daughter Nicole was placed on MiraLAX when she was just 3 1/2-years-old. Within ten days, she says Nicole turned manic, aggressive, and paranoid. “It was horrifying to see my daughter change like that and to not come completely go back to normal,” Ward said. “Near psychiatric events with paranoia, mood swings, aggression, rage,” parent Jeanie Ward said. “He had the rage, fears, phobias, anxieties,” parent Sarah Locatelli said. “We saw a lot of the anger, a lot of the rage, a lot of the aggression,” parent Mike Kohler said. Chiropractic adjustments have been proven to assist in alleviating the pain and symptoms of constipation in pregnancy, infants, school age children and into adulthood. The nerves that exit your lumbar spine directly supply function to the bowels. So it makes complete sense that any interference to these nerves can create a problem…commonly CONSTIPATION! Posted on March 9, 2017 by Molly Scott, D.C. However, that means so are all those common allergens. It can be a disappointment when all you want is to open your windows and spend time outside as the weather is warming but you know you will pay for it with your allergy symptoms. The fresh green grass and the beautiful blooms of the trees and flowers sounds so wonderful but can sound like a nightmare to allergy sufferers. There are plenty of commercials telling you of the different over the counter medications you can take to help with those pesky symptoms…however, what they don’t tell you are the many side effects that these meds can cause. You may notice less sniffles, watery eyes or itchy throat but are those really worth the tradeoff of something much more serious? I have compiled a small list of some surprising side effects of your beloved Benadryl, Claritin or Zyrtec (to name a few). ~Impaired thinking. We have all heard that some of these over the counter (OTC) drugs can cause drowsiness…I’ve actually heard plenty of parents giving their children Benadryl for this very reason, to help put them to sleep…but causing sluggishness, decreasing mental sharpness and actually causing cognitive impairment is not a feeling I want for myself or for my children. ~Increased appetite. There are likely many reasons you can’t put those Girl Scout cookies down but taking medication with antihistamines can actually stimulate your appetite. Taking these meds on a regular basis or over the long term can be a reason you may notice weight gain. ~Altered sense of taste or smell. There is preservative and sometimes fragrance added to nasal sprays that can change your sense of smell which, in turn affects your sense of taste as well. You may notice some of your favorites don’t smell the same or your food is bland due to these additives. ~Long term health issues such as osteoporosis or diabetes. Often steroid creams are prescribed during allergy “season”. The stronger the steroid, the more body surface covered and the longer it is used can lead to decrease growth rate in children, increase in developing cataracts and may also be associated with osteoporosis and diabetes. Long term steroid use is not ideal. ~Infertility. Many fertility specialists believe the drying of the mucous membranes, caused by most allergy drugs, could lead to infertility. This does make sense. ~Anxiety. The stimulant properties of many allergy meds give heart palpitations, insomnia and anxiety. If you are already prone to these issues or to panic attacks, these drugs will only worsen your condition. ~Depression. Have you been feeling unusually sad? This is a lesser known side effect of allergy drugs with antihistamine. The sedatives in these meds can exacerbate existing depression or trigger a new found feeling of unhappiness. Low libido is a take-off of this as well. When you are depressed and sluggish, I doubt you will be in the mood for intimacy. Chiropractic has been shown to decrease symptoms. Regular chiropractic adjustments allow the body to function properly helps the body’s immune system function at full speed and is great for ridding head and sinus congestion. Acupuncture has been shown to have amazing results with sinus pressure/congestion relief as well as decreasing those other annoying symptoms such as itchy throat, itchy and watery eyes. Natural supplements! We carry an amazing supplement called D-Hist for adults and children. It has NO side effects and has been excellent for curbing those symptoms I get every spring. My kids take the children’s formula as well with their daily vit D and probiotic. There may still be a slight amount of sneezing, congestion, etc, but very minimal and worth it for me not filling my body with the drugs that are causing all these issues mentioned above. In my mind, I would prefer to have a bit of a stuffy nose or itchy throat for a few weeks than to worry about depression, anxiety, weight gain…and so on. Please let us know if you have questions and let us know how we can help you and your family enjoy this spring, drug free!! Baby in breech presentation? Look to chiropractic & Acupuncture! Posted on October 18, 2016 by Molly Scott, D.C. Here is the background; Patient was referred to our office at her 37th week of pregnancy as she was just informed her baby is in breech presentation. She was scheduled by her OBGYN for external cephalic version (ECV) for later in the week. If you are unsure of what ECV is, it is an attempt to turn the baby to a head down position with the use of external force on the abdomen. I have not had this procedure performed on me, thankfully, as I see it to be extremely aggressive and hear it to be extremely painful. There can also be many complications resulting from ECV including premature rupture of membranes, changes in baby’s heart rate, placental abruption and preterm labor typically ending in emergency cesarean section. This can all be very scary, especially for a first time mother. I was pleased to adjust this patient with the Webster technique as well as use acupuncture on specific points for assisting with moving baby to head down position. The Webster technique is a chiropractic adjustment that is a gentle and specific sacral adjustment to help facilitate the mother’s pelvic alignment and nerve system function. This in turn balances pelvic muscles and ligaments, reduces torsion to the uterus and offers a greater potential for optimal fetal positioning. After only 2 adjustments/acupuncture treatments, the patient followed up with the OBGYN who reported what the mom-to-be already suspected…”no need for ‘version’ as the baby is in vertex position”. Although I have lost count of how many “success stories” like this we have heard in the office, it makes my day every time and brings a smile to my face knowing we took something that could have been a negative and traumatic experience and made it beautiful again! I will continue to see this patient until delivery as adjustments to the lower back/pelvis are shown to reduce labor time by 33%! Please keep this in mind and if you hear someone mention that they or someone they know have a breech positioned baby, I hope you will think of me!! Posted on June 16, 2016 by Molly Scott, D.C. This article is a good/quick read regarding acupuncture and its ability to help alleviate the symptoms of menopause. We have had great success in the office with this as it is such a common discomfort. Patients are extremely excited to be able to avoid meds/hormone therapy by utilizing acupuncture. Please have a read and/or pass along to someone who may benefit from this treatment. A new study has found that acupuncture treatments can reduce the number of hot flashes and night sweats associated with menopause by as much as 36 percent. “Although acupuncture does not work for every woman, our study showed that, on average, acupuncture effectively reduced the frequency of hot flashes and results were maintained for six months after the treatments stopped,” said Nancy Avis, Ph.D., a professor of public health sciences at Wake Forest Baptist Medical Center and lead author of the study. Funded by the National Institutes of Health, the study included 209 women between the ages of 45 and 60 who had not had a menstrual period for at least three months. On average they had at least four hot flashes or night sweats a day in the previous two weeks. Participants received a baseline assessment and were then randomly placed in one of two groups. The first group received acupuncture treatments during the first six months. They were then followed without receiving acupuncture for the second six months. The second group did not receive any acupuncture during the first six months, but did receive acupuncture for the second six months. The women were allowed up to 20 treatments within six months provided by licensed, experienced acupuncturists in the community. 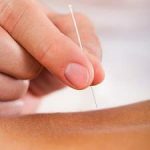 According to Avis, the study was designed to make it more “real world” by leaving the frequency and number of the acupuncture treatments up to the study participants and their acupuncturists. All the women kept a daily diary on the frequency and severity of their hot flashes. They also answered questionnaires about other symptoms every two months. After six months, the first group reported an average 36.7 percent decline in the frequency of hot flashes compared to baseline measurements. After a year, the benefits persisted, with the women maintaining an average 29.4 percent reduction from baseline. The second group reported a six percent increase in symptom frequency during the six months when they were not getting acupuncture, but had similar results — an average 31 percent reduction in frequency — to the first group after receiving acupuncture during the second half of the trial, the researchers reported. Avis cautioned that the effect shown in the study could be due to non-specific effects, such as the additional care and attention the study participants received or the expectation of a benefit. She also said that additional research is needed to identify individual differences in response to acupuncture. The study was published in the journal Menopause. Posted on June 7, 2016 by Molly Scott, D.C.
A few of the common questions we get when encouraging a parent to bring their kids into the office are: Why would a child or especially an infant need chiropractic care? Is it safe? Do you adjust them the same way you adjust an adult? What does the adjustment help with? As your child grows, they will begin to have numerous things happen to them that will cause subluxation/nerve interference in their spine. Trying to hold their head up, or “bobble head syndrome” as we like to call it. Also rolling over, crawling and of course walking lead to a number of bumps and bonks that can cause their malleable vertebrae to move out of place. As toddlers and children they have their fair share of falls, tumbles and stumbles. These are a few more important reasons they should see a chiropractor. Yes, it is very safe and is much different than how an adult is adjusted. Our 3 girls were checked and adjusted as soon as 30 minutes old. Although they were all born naturally and with the most minimal interference by our midwife of just “guiding” them out, they all had subluxations at the C1 vertebra. The adjustment is made with the light pressure of my pinky finger (the pressure is that of pressing on a ripe tomato before the skin indents). Their little joints are so tiny and their vertebrae are not completely formed yet, so it takes minimal force to relieve the pressure on those nerves. We have seen an array of different issues/concerns in our office that have had amazing success. It has been shown that chiropractic can help with colic, difficulty latching, torticollis, constipation, diarrhea, reflux, acid reflux, trouble sleeping, ear infections/aches and the list goes on. We also see many families for overall wellness care as they may not have anything specific bothering them, but we keep them feeling great. If you have any questions about pediatric chiropractic, nutritional components to integrate into their diet or any other concerns, please contact us and we would love to answer those questions for you! Also, please tell your friends, family and coworkers with kiddos about us as we would be happy to help them as well and appreciate your referrals! Posted on August 6, 2015 by Molly Scott, D.C.
Dr Molly specializes in treating pregnant women, newborn babies and families through chiropractic adjustments and/or acupuncture. When it comes to your diet during pregnancy, I’m sure you will hear “take advantage of being able to eat anything you want!” This is NOT the way to go about it! If you start off at a healthy weight, you need no extra calories during the first trimester, about 300 extra calories a day in the second trimester, and about 450 extra calories a day in the third trimester. Most pregnant women need to get more protein, vitamins and minerals such as folic acid and iron. This means eat lots of lean meats/poultry, veggies (green leafy are best) and make sure you’re taking a quality prenatal supplement. We carry the very best researched and studied nutritional supplements in the office at a comparable price to what you are likely paying already. Also, increase your water intake. You should typically be drinking half your body weight in ounces of water every day (ex: wt. 150lbs=75oz H2O) and need to drink even more during pregnancy as that baby will require more fluid than you are used to…You’re drinking for 2! 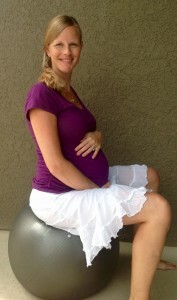 There are some great & easy exercises to do during pregnancy. The hormone relaxin is released during pregnancy to help with joint laxity. Simply walking helps to keep the body in balance as you get closer to delivery. Try to walk 30 minutes every day. Make an exercise ball your new best friend. Just sitting with proper posture and a slight bouncing motion will help stretch pelvic joints and keep baby moving downward. Pelvic tilts and hip hikes on the ball are great exercises to utilize throughout pregnancy and especially when you are preparing for the big day. Pelvic tilts consist of small forward to backward movement of the pelvis. Sitting straight and tall on the ball with legs spread wide and focus on moving only your pelvis to roll the ball slightly forward and back again. Similarly, hip hikes will be the same starting posture but then imagine bring your hip toward your ear on one side, then the other. These should both be performed 5-10 minutes, 3 times per day. Finally, sitting on the floor in butterfly position will not only create a nice stretch for your adductor and groin muscles, but will also work to open the pelvis so baby can move into position for optimal delivery. Perform this stretch 3 times per day and hold each stretch about 5 minutes. Sleep is one of the most beautiful things we get as it is a time to relax, recharge and reset the mind and body. Be sure you are getting the proper amount of sleep to keep you and your growing baby healthy. It is recommended that the average person needs 8-10 hours per night. For proper support we suggest you sleep on your left side while pregnant with a thin pillow between your knees for pelvic support, hug a pillow or spouse to keep your upper back in ideal posture and a supportive neck pillow to keep your head in a neutral position. We carry a pillow in the office that offers support, correction of the neck curve and is extremely comfortable at the same time! Please ask us about them next time you’re in. Of course chiropractic and acupuncture are extremely important during pregnancy as well as post-partum. Getting regular adjustments helps to keep proper motion in the joints that desperately need it. With the growing belly in the front, mothers-to-be tend to notice an increase in discomfort in the back as they try to keep themselves upright. As you near the end of the pregnancy, adjustments and acupuncture can be utilized to assist in a smooth delivery with much less pain than one would normally experience. These two techniques are also great tools in helping to move breech babies head down, assist in labor induction (if it’s that time) and relieve the “back labor” and sciatica that can often come with pregnancy. Post-partum we encourage mom and baby get checked as labor/delivery can be difficult on both of you. Posted on March 2, 2015 by Toby Scott, D.C. Sport Physicals $50 Call Today! The Chiropractors at ProCARE are Olathe, Overland Park, Gardner and Spring Hill's Chiropractic choice for auto, sports and work injuries, back pain, neck pain, headaches and more. ProCARE Chiropractic is the place for all your injuries and injury related concerns. 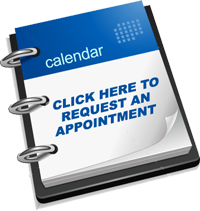 We offer a variety of services dedicated to helping you maintain an active lifestyle without suffering. ProCARE Chiropractic offers comprehensive chiropractic care including examination, diagnosis, X-ray and management. We also offer acupuncture, full-injury rehabilitation and performance enhancement for the spine and extremities.